Today – following housing bubbles, bank collapses, and high unemployment – the Internet remains the most reliable mechanism for fostering innovation and creating new wealth. But this engine of innovation is under threat. The Internet’s remarkable growth has been fueled by innovation. 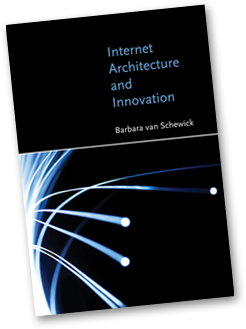 In this pathbreaking book, Barbara van Schewick argues that this explosion of innovation is not an accident, but a consequence of the Internet’s architecture – a consequence of technical choices regarding the Internet’s inner structure made early in its history. The Internet’s original architecture was based on four design principles: modularity, layering, and two versions of the celebrated but often misunderstood end-to-end arguments. This design, van Schewick demonstrates, fostered innovation in applications and allowed applications like e-mail, the World Wide Web, E-Bay, Google, Skype, Flickr, Blogger and Facebook to emerge. Today, the Internet’s architecture is changing in ways that deviate from the Internet’s original design principles. These changes remove the features that have fostered innovation in the past and threaten the Internet’s ability to spur economic growth, to improve democratic discourse, and to provide a decentralized environment for social and cultural interaction in which anyone can participate. While public interests suffer, network providers – who control the evolution of the network – benefit from these changes, making it highly unlikely that they will change course without government intervention. Given this gap between network providers’ private interests and the public’s interests, van Schewick argues, we face an important choice: If no one intervenes, network providers’ interests will drive networks further away from the original design principles. If the Internet’s value for society is to be preserved, policymakers will have to intervene and protect the features that were at the core of the Internet’s success.